Explanation: The disk of our Milky Way Galaxy is home to hot nebulae, cold dust, and billions of stars. This disk can be seen from a dark location on Earth as a band of diffuse light across the sky. This band crosses the sky in dramatic fashion in the above series of wide angle sky exposures from Chile. The deepness of the exposures also brings to light a vast network of complex dust filaments. Dust is so plentiful that it obscures our Galaxy's center in visible light, hiding its true direction until discovered by other means early last century. 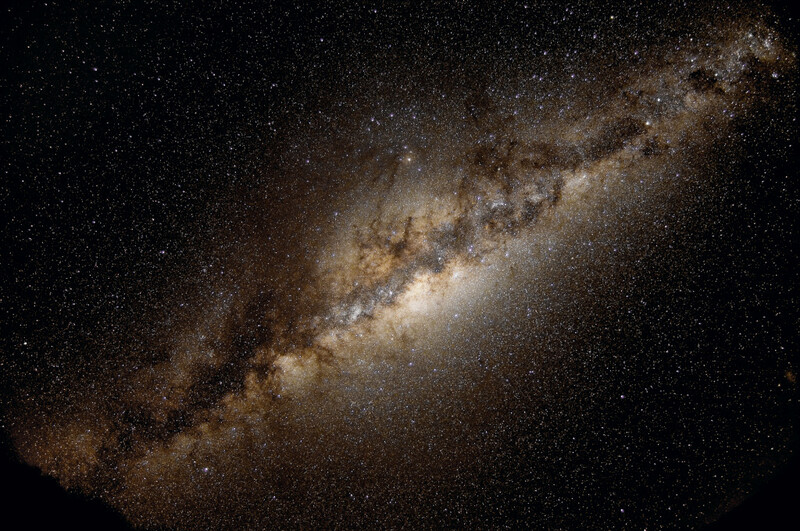 The Galactic Center, though, is visible above as the thickest part of the disk. The diffuse glow comes from billions of older, fainter stars like our Sun, which are typically much older than the dust or any of the nebulae. One particularly photogenic area of darkness is the Pipe Nebula visible above the Galactic Center. Dark dust is not the dark matter than dominates our Galaxy -- that dark matter remains in a form yet unknown.